The report settings dialogue offers a variety of options to allow you to customize how reports are printed. This gives you more control over how the reports are created. The dialogue is in four main sections, each of which is described in detail below. To the right is a preview area where you will get an idea of what your exported report will look like. As you make changes to the settings the preview is updated immediately. You can also preview what the printed report would look like and print it from here. Learn more about the Report Settings window by looking through the rest of this help topic. Or, as an alternative, click on the item you are interested in on the screenshot above. There are five font settings that can be changed. Use the dropdown list to select which font you would like to change. Then select a different font or modify the current font style and colour properties. There are three settings that affect how the table is displayed. Cell Padding refers to the gap between each cell in the table. Cell Spacing refers to the gap between the text in the cell and the edge of the cell (think of cell spacing as a kind of margin area around the text). This will also apply to the grid lines. So you can create a kind of double-line style effect. 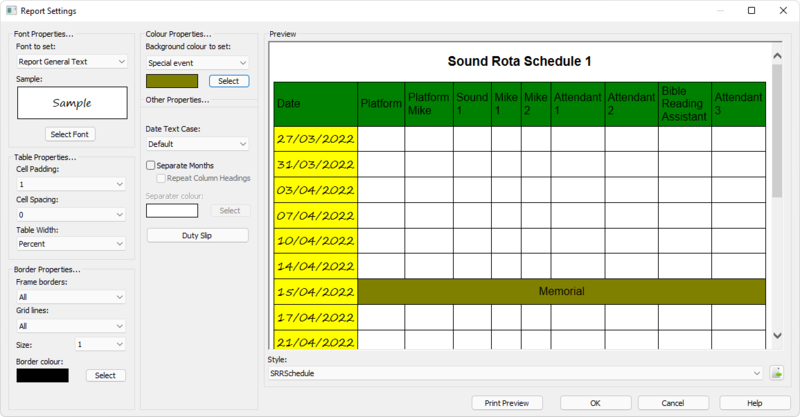 Table Width can be set to one of two options. Literal lets the system decide how wide each column width should be. Literal will generally avoid word-wrapping if it can. Percent will cause the table to be 100% wide and all the columns would be proportionally adjusted to fill this space. Click the Columns button to adjust the Column Order on the exported document. You can also specify columns that you don't want printed or exported. Click on the link for full details. Size refers to the thickness of the border. If you set this value to 0 then no frame or grid lines will be visible in the exported document. Border colour is the colour of the grid lines. Click the Select button to display a colour dialogue from which you can select a different colour. Simply select the colour property you want to change and then click the Select button to display a colour dialogue from which you can select a different colour. Dates are displayed using the operating systems default settings. Dates are displayed with the first letter of each word is capitalized. Dates are displayed in lowercase. Dates are displayed in uppercase. This causes the schedule to include a small gap between each calendar month. Options are provided for you to specify the colour of this gap. 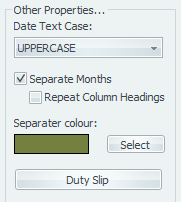 You can specify the colour for the separator by clicking the Select button. This will cause the column headings to be repeated at the start of each month. Press this button to display the Duty Slip Settings window. here you can adjust the labels used on the slips. Make sure you select the correct style template too! This feature is provided for advanced customization. By adapting the default template and cascade style sheets you can change the look and feel of the schedules in ways not directly supported in the application. Read up on the help topic if this interests you! Since there are so many enhancements that you can make for exporting to HTML we thought it a good idea to include a HTML Print Preview button to the dialogue. From the Print Preview, you can alter the page setup, margins, header, footer and printer details. Of course you can also print! It saves you having to open up the HTML file in Internet Explorer or Word to print it. Note that this is an Internet Explorer Print Preview and any changes you make to page setup etc. will also be applicable to Internet Explorer and not just Meeting Schedule Assistant. You can also display the print preview directly from the Assignments Editor.